Why did so many of my higher ed colleagues take this course? 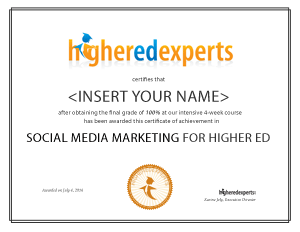 More than 150 of your higher ed colleagues have figured out their social media strategy by taking this constantly updated professional certificate online course since February 2012. Ready to tackle Social Media Marketing for Higher Ed? 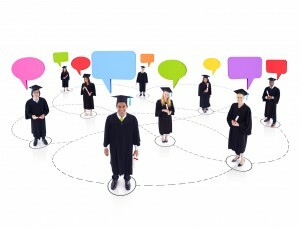 Has social media marketing become your responsibility at your institution? Are you in charge of your school’s social media accounts? Will you soon design the social media marketing strategy for your university, college or unit? Exciting — and overwhelming, we know. That’s why we want to help you as we’ve helped more than 150 of your colleagues working in universities and colleges. This course was designed for YOU, to help you get up to speed and optimize your social media strategy and operations at your school. What will I learn about Social Media Marketing for Higher Ed? exchanging with a small group of your peers in our sessions limited to a few (<10) participants working in institutions of higher education. working on weekly social media marketing hands-on assignments you can use the next day at work: presentations, memos, plans, etc. Should I take this course on Social Media Marketing for Higher Ed Course? No travel expenses or down time while you learn much more than you would by attending any 2-day workshop or conference: 8 weeks give you the time to absorb all the concepts and acquire new skills. The focus of this course is social media marketing for higher ed: everything will apply to your situation. Your classmates will all work at universities, colleges or schools: you’ll find out how other institutions tackle social media marketing challenges. Course materials: written lectures, readings, videos, quizzes, 8 graded discussions & 8 graded assignments. Unlimited questions via the “Ask the Prof” discussion board during the 8-week session. Recognized certificate of achievement in social media marketing for higher ed upon completion of the course with a final grade of 80% or more. Find out why Kelsey Seymour (@kelseylseymour), Communications Officer at UNB took, liked and recommend this course in this 2-min video recorded in June 2014 via Skype. The real-world examples, and all of the weekly topics and assignments are very applicable to your job as a social media manager. For me, this was much more beneficial than a conference, as I had tangible ideas and projects I could implement right away. I would recommend this course. I thought the layout and design of the course was very good. The topics flowed into one another nicely and the materials provided were helpful and in-depth. We look forward to using the best-practices we've learned in the course on our own social media platforms. The Social Media for Marketing Course was informative and engaging. I looked forward to it every week and learned something new every time I logged on. This course is highly valuable and 100% worthwhile. I found it challenging and informative from every perspective. I learned a great deal from the online discussions with my colleagues as well as from the instructor and the content provided through the course website. In all, it was a very positive learning experience. I would recommend this course to anyone who wants a greater knowledge of strategic marketing through social media. I would highly recommend this course. You get out what you put into the course, so taking full advantage of the abundance of resources and materials in the class, as well as the discussion with peers, is a sure way to increase your knowledge and passion for social media marketing. The topics covered are diverse and relevant, and class discussions with my peers inspired me to think in new ways. I am so fortunate to have been able to participate in this class. 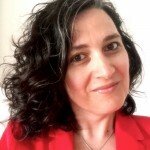 I've done so many webinars, joined so many groups, attended so many conferences and none have come close to the experience and knowledge I gained from working with Karine. I was looking for something to really hone my skills, as many courses you come across are very entry level. Each week you are given the materials for a deep dive into a topic to perfect your digital content strategy. It was a long eight weeks, but I feel more prepared and poised to take on the next phase of my professional journey. I would highly recommend this course to anyone who has a passion for Higher Ed Marketing. The insights, structure and collaborative nature of the class made it a high impact experience that will surely elevate the quality of my social strategy and practices as I move forward in the field. I would definitely recommend this course for beginning to mid-career social-media managers. I would definitely recommend the Social Media Marketing for Higher Education course to anyone who works in marketing or social media at a college or a university. I learned a tremendous amount from the course and Karine Joly. There are things that I never even considered before that I am now implementing at my college and seeing great results! Thank you for an educational and enlightening experience! I would definitely recommend this course to others! Even if you think you know all there is to know about social media marketing, this course will teach you something! I walked away from this course more confident in my ability to execute a successful social media marketing campaign, and with a deeper understanding of social media in general. While the task of taking a 8-week course while working full-time may seem daunting, the layout of this course makes it doable! One of the biggest benefits of this course was learning from other professionals in your field and receiving their constructive criticism and feedback. I would definitely recommend this course! Not only did it give me a lot to think about for my daily job, but it was presented in a really upbeat and enthusiastic way. That enthusiasm was easy to catch and share as we went through it every week. That could be because Karine Joly is clearly passionate about the subject! Social media is still something we're all learning about, so it's great to get a leg up this way on how to utilize it the best. Wonderful class! Even though I have been working with social media platforms for several years, I still found the class to be a terrific learning experience. I was always excited to start implementing what I learned each week to help improve our social media presence. I recommend this course to anyone interested in learning how to use social media to enhance your school's reputation and build relationships with your stakeholders. Whether you're a one-person shop (like me) or part of a marketing communications department, this course will give you the knowledge and skills to take your social media activities to the next level. I gained practical skills and developed a broader appreciation of how to use social media ethically and strategically to strengthen our school's marketing and communications campaigns. I would recommend this course to anyone who wants to improve their social media skills. You'll gain new insights and also new knowledge from other students in the class. I've been working in higher ed social media since the advent of Facebook pages, so I came into this course with a fair amount of experience. However, I've never felt like an "expert." In the context of a social media focused position (I was formerly a public relations specialist a.k.a. jack of all trades at a small college), I feel much more immediacy for getting our university's social media presence organized and intentional. And, now I can. This course helped ground me in strategy and assessment, which are the very elements necessary for impacting departmental and even institutional change. I would definitely recommend this course to anyone who wants to avoid "Can you post this?" status and become a true campus leader for social media. I would highly recommend this Social Media Marketing in Higher Ed course. Although I have studied marketing, business and accounting in my undergraduate studies, this course provided the foundation knowledge to build successful social media marketing campaigns. The instructor led us through all the steps, from the basics, social media guidelines, strategic planning, how to design an real advertising campaign, web writing and last, but not least, how to assess and evaluate the success of your social media campaigns. All the course resources are relevant and current for today's social media environment. The weekly discussions with colleagues from other colleges and universities were valuable to me because of the information sharing. In summary, the course was a valuable learning experience because I can use the knowledge gained today in my job. I would definitely recommend this course. Get ready to work hard and become well-versed in the art of social media. Everything you learn you will be able to apply immediately and see measureable improvements. This course will take you from "newbie" status to an authority on social media marketing on your campus. Even if you are not new to social media marketing, this course will update and improve your skillset for this growing medium of marketing. I would recommend this course to any communications manager/director. It provides a great overview of how to use social media with communications strategies in higher education. This is the place to go if you are in higher education and you need the skills in order to kick off your social media planning or are just in need of enhancing those skills you've picked up along the way and learn how to do things better. Our school doesn't have a budget to hire a full time social media expert, so I volunteered to take the class to learn more about social media campaign planning. I had no idea just how much was involved in running a successful campaign. This course taught me how to run a campaign from start to finish. The social media marketing course is work, but it helps you grasp a large number of concepts and learn how to enact them in your day-to-day work experiences —and, more importantly, how to integrate them in the long run. I learned a great deal of information that helped and will help me create a successful Social Media Campaign. What a great class. It's a sophisticated look at social media marketing, covering established best practices while also acknowledging that the field is changing every day. You'll get to workshop your ideas with colleagues, while also getting input straight from Karine. Really valuable! When you approach social media and all of the things you must do to make it effective, it can seem overwhelming. This course breaks up all of the different aspects of social media marketing which helps with framing. The Social Media for Higher Ed course allowed me to see all the steps of social media management and has given me perspective on each portion. Worth every penny! I recommend this course for anyone interested in expanding their knowledge of social media marketing. I saw almost immediate results as I implemented ideas from the course and from my course mates into my work! This course exceeded my expectations. So many of the modules were perfectly in tune with projects or challenges I was facing at work! I attended two higher ed conferences while taking the course, and the class material complemented and supported what I was hearing from other experts in the field. With the knowledge base and ideas I developed during this course, I am ready to lead the social media team at my institution in the transition toward using social media to influence behaviors and support business goals. What I like most about this course is the interaction with others form the higher ed field. Even though I'm based in Australia, I got to interact with people from the USA and Egypt and learn from their experience and ideas. Whether you're just starting to experiment with social media marketing or are hoping to be more strategic about your efforts, Karine Joly's course will give you the tools you need (and for people like me, the tools you didn't even know existed) to be successful. The content this course provides is a must-have for anyone responsible for social media marketing at their institution. When I first enrolled, I thought, "Oh this will be a breeze! My job is marketing, and I manage our social media platforms." Was I ever wrong! From the very first week I have been introduced to valuable information and tools that I was unfamiliar with. The pace of the course allowed me to introduce what I learned to my staff, and my office, and use it in our daily practice immediately. Terrific course! Provides the framework needed to strategically plan and implement effective social media marketing for higher ed. This class has given me a new found confidence in my social media duties. It was great that we used real life, applicable scenarios and learnings instead of detached theory that we'd never get to apply in our jobs. By the third week I was applying my learnings in my job, and by the end of the course I had a full suite of tools and knowledge that I can use to make social media better at my institution. Karine is a wonderful instructor and provides helpful constructive feedback. This course requires a moderate knowledge of social media platforms and is not for beginners. The course assignments are very intense--especially the first five weeks. I recommend this course. I've tried to keep up on my own with blogs, articles, conferences, etc, but this course curates the best resources and presents them in an organized manner so that I was able to get the most out of them. A great learning experience! The curriculum in this social media marketing course is relevant and well selected for the level of the course. This is a serious and concentrated course, not fluff, and it helped me learn the topic in a short time. The interaction with the instructor tied all of the resources together in a meaningful way. It was 100% worth the cost. I would highly recommend taking this course. This structured program offers lots (many!) of resources during the eight weeks--each week focusing on a different topic areas--that were valuable and trustworthy. I have spent hours searching the Internet and reading marketing and higher ed blogs trying to find information and social media best practices like the ones provided in this course. It's exciting that I now have all the tools I need to do my job well. I'd certainly recommend this course, even if you've been working in higher ed online for many years like I have. You'll be surprised what you don't know, but also what you do know, but didn't know how to articulate. I highly recommend this class. It has opened my eyes and inspired me to take a whole new approach to my institution's social media efforts. I have already seen measured" improvement in the College's campaigns. This course is a fantastic introduction to social media for anyone working in the higher education sector. The assignments are interactive and interesting, and force you to apply the knowledge gained from the week to your assignment. It also gives you access to articles about social media use in the higher education space that would be otherwise difficult to find. These are a great resource for future reference. The instructor is dedicated and open to new ideas. She never criticises, but offers constructive advice. I'd recommend this course to anyone interested in improving their abilities in social media marketing. Great class. I learned a lot, along with obtaining great resources. This course really opened my eyes to a new way of thinking about our college's web presence, and how we could more effectively use social media to reach our goals. I've enjoyed the course and learned a lot. I would definitely recommend it as this has definitely broadened my knowledge about social media marketing.